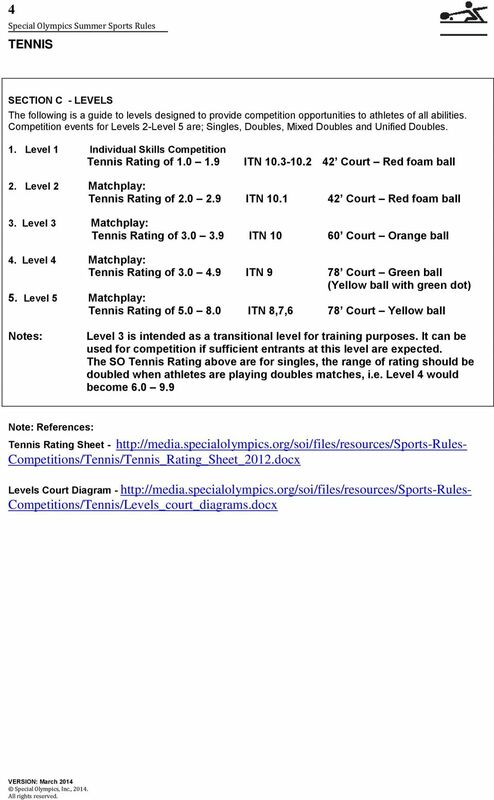 1 1 The Official Special Olympics Sports Rules for Tennis shall govern all Special Olympics competitions. 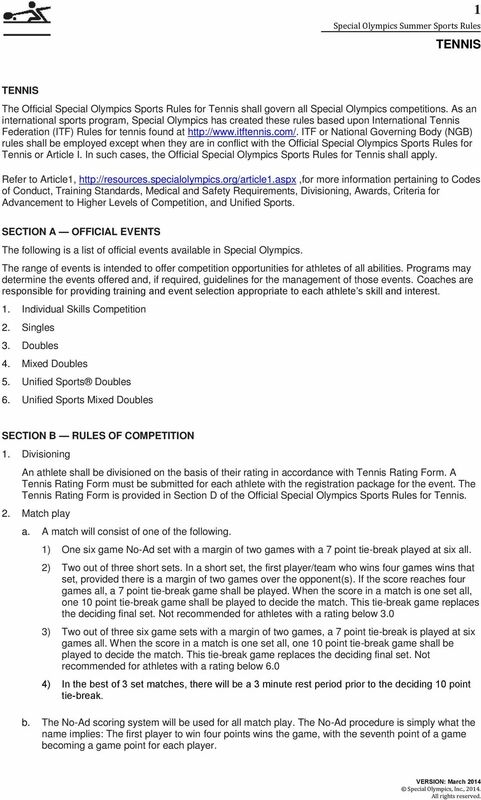 As an international sports program, Special Olympics has created these rules based upon International Tennis Federation (ITF) Rules for tennis found at ITF or National Governing Body (NGB) rules shall be employed except when they are in conflict with the Official Special Olympics Sports Rules for Tennis or Article I. In such cases, the Official Special Olympics Sports Rules for Tennis shall apply. Refer to Article1, more information pertaining to Codes of Conduct, Training Standards, Medical and Safety Requirements, Divisioning, Awards, Criteria for Advancement to Higher Levels of Competition, and Unified Sports. SECTION A OFFICIAL EVENTS The following is a list of official events available in Special Olympics. The range of events is intended to offer competition opportunities for athletes of all abilities. Programs may determine the events offered and, if required, guidelines for the management of those events. Coaches are responsible for providing training and event selection appropriate to each athlete s skill and interest. 1. Individual Skills Competition 2. Singles 3. Doubles 4. Mixed Doubles 5. Unified Sports Doubles 6. 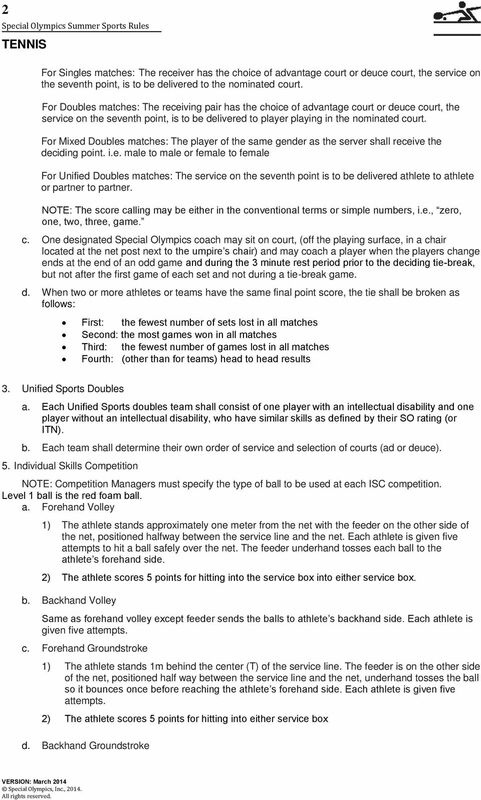 Unified Sports Mixed Doubles SECTION B RULES OF COMPETITION 1. Divisioning An athlete shall be divisioned on the basis of their rating in accordance with Tennis Rating Form. A Tennis Rating Form must be submitted for each athlete with the registration package for the event. 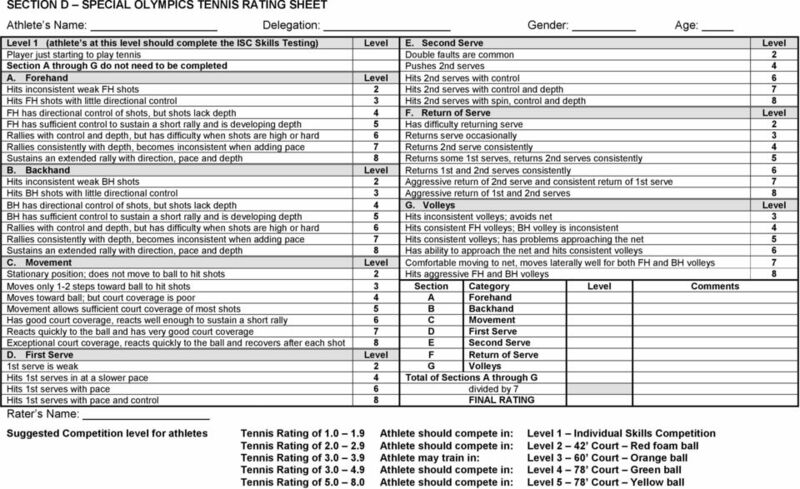 The Tennis Rating Form is provided in Section D of the Official Special Olympics Sports Rules for Tennis. 2. Match play a. A match will consist of one of the following. 1) One six game No-Ad set with a margin of two games with a 7 point tie-break played at six all. 2) Two out of three short sets. In a short set, the first player/team who wins four games wins that set, provided there is a margin of two games over the opponent(s). If the score reaches four games all, a 7 point tie-break game shall be played. When the score in a match is one set all, one 10 point tie-break game shall be played to decide the match. This tie-break game replaces the deciding final set. Not recommended for athletes with a rating below 3.0 3) Two out of three six game sets with a margin of two games, a 7 point tie-break is played at six games all. When the score in a match is one set all, one 10 point tie-break game shall be played to decide the match. This tie-break game replaces the deciding final set. Not recommended for athletes with a rating below 6.0 4) In the best of 3 set matches, there will be a 3 minute rest period prior to the deciding 10 point tie-break. b. The No-Ad scoring system will be used for all match play. The No-Ad procedure is simply what the name implies: The first player to win four points wins the game, with the seventh point of a game becoming a game point for each player. 3 3 Same as forehand groundstroke except the feeder sends the ball to the athlete s backhand side. Each athlete is given five attempts. e. Serve Deuce Court Each athlete is given five attempts to hit a legal serve from the right court to the deuce service box. A ball landing in the correct service box will count 10 points. A zero (0) score is recorded if the athlete commits a foot fault or fails to get the ball in the service box. A foot fault occurs when the athlete steps on or over the service line. f. Serve Advantage Court 1) Same as serve to deuce court but from the left court to the advantage service box. Each athlete is given five attempts. g. Alternating Groundstrokes with Movement 1) The athlete begins 1m behind the center (T) of the service line. The feeder is on the other side of the net positioned halfway between the service line and the net., alternates underhand tosses to the athlete s forehand and backhand sides. Each toss should land at a point which is both halfway between the service line and the net and halfway between the center service line and singles sideline. The athlete must be allowed to return to the center mark before feeding the next ball. Each athlete is given ten attempts. 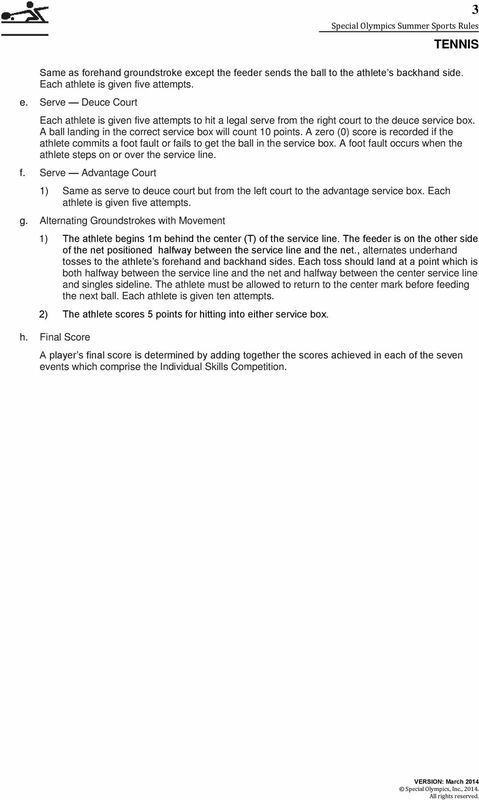 2) The athlete scores 5 points for hitting into either service box. h. Final Score A player s final score is determined by adding together the scores achieved in each of the seven events which comprise the Individual Skills Competition. Warm ups for adults it OK, I ran from the car! Until now, it has been virtually impossible for two righties at the net to pick on the Deuce court player (Backcourt Player 1). UTAH STATE UNIVERSITY Department of Health, Physical Education, Recreation PEP 2400 SKILLS 4 FUNDAMENTALS OF TENNIS BADMINTON RACQUETBALL- TRACK AND FIELD PICKLE BALL FALL SEMESTER 2014 Instructor: Dr.
TABLE TENNIS Game Rules & Specifications INTRODUCTION About EastPoint Sports EastPoint Sports designs and delivers home recreational products that offer the best price-value relationship in the industry. Badminton Unit Plan. Standard 6: Values physical activity for health, enjoyment, challenge, self-expression, and or social interaction. table Tennis Spirit of the Games: Excellence through competition how does your sport exemplify these values? Supporting team members being prepared to share your enthusiasm with others who need encouragement. Sports Activity Pack Sports Activity Pack Active Schools has created this games pack to provide you with ideas for games and specific sports to assist you with school clubs, PE classes or playground activities.